Community Work: Projects driven by partnerships with community leaders and organizations to strengthen existing work and develop new areas of impact to positively and sustainably affect change to improve urban health. 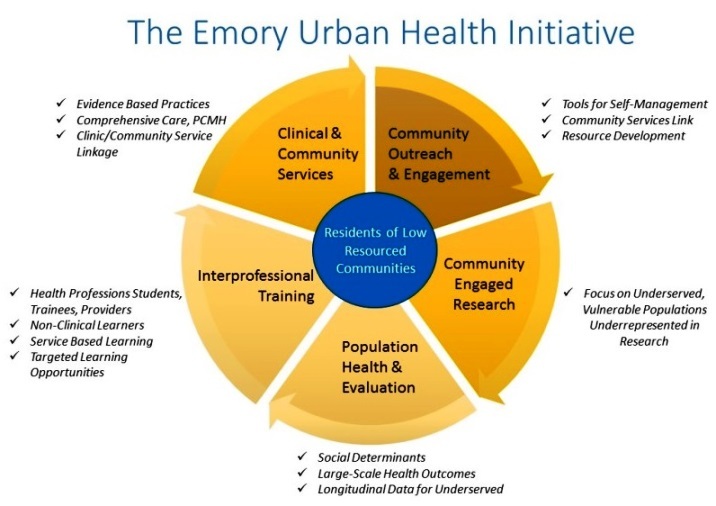 Education: This area encompasses courses at colleges and universities in which students collaborate with community partners to enrich their academic engagement with urban health issues while contributing meaningfully to a partners’ important work. Additionally, UHI trains future health professionals. As future healthcare and service providers, medical, nursing, PA, public health, and theology students will play a vital role in the health and wellbeing of the communities they serve. UHI contributes to ensuring holistic health education through trainings on advocacy, social determinants of health, community-based participatory research (CBPR), and effective work in underserved communities. Research: With strong ties to academic institutions whose research seeks to address health disparities, UHI supports community-driven and community-focused research on urban health challenges and solutions.